You know what’s fun!? Asking vendors for a cash discount. That’s fun. And they do it. Most businesses spend at least 2% on credit card fees. We always ask for a cash discount and most folks are happy to give us one. It’s fun to see the look on the cashier’s face when we hand over $5000 in cash. We wanted a mortgage-free home. We made a plan. We’ve worked this plan for five years. We’ve been working hard at this plan for five years. Hard. Like working two jobs, scavenging for materials, buying land, working soul-killing jobs, saving, building the tiny house, quitting soul-killing jobs, making decisions to stay home and save our cash rather than go out, growing our own food to save on groceries, building up our savings, spending it, building it up again. It’s a cycle of working for money and then spending it working on the house. It’s hard, but deeply rewarding. Karl is working full-time on the house now, so that we can get it dried in before winter. This week we spent $5000 on windows and $1688 on roofing, and the fund is low again. This is scary. 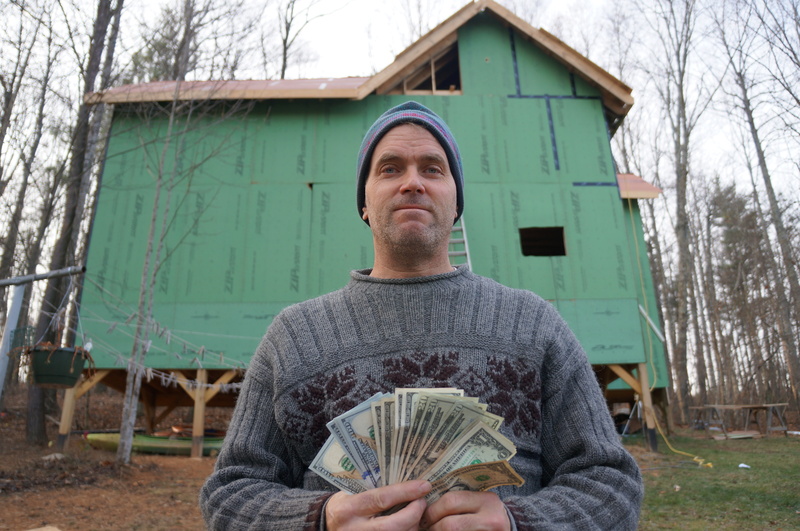 Not knowing where the money will come from to finish the house is unsettling for both of us. Even though we are doing what we planned, it’s scary to get so close to zero again. But we’ve made it this far. When we first came across the idea of building a mortgage-free home, we had about $300 in our bank account. The idea that we could really build a mortgage-free home seemed impossible. This is how we accomplish the impossible: We run on faith, our own deep knowing that we are always supported. What we need will come to us in the moment of need. In doing our part, the rest will fall into place. We do what’s next. That might mean getting another job, or writing another book, or salvaging another barn, or putting on the roof. We keep moving, and the answers come. And, of course, none of us is afraid of hard work. We have enough money to finish the exterior. At that point we’ll know what’s next. If you are considering making a big lifestyle change, break it down into phases. Remember to celebrate your accomplishments and keep the faith. Slow and steady wins the race! We are developing an e-course to help you with your big lifestyle change. Sign up for our newsletter for learn more about the course. Slow and Steady indeed! Living with Faith and knowing the Universe indeed wants to support us all. I love this post. I feel it here too, in a different way. I feel the swell underneath the tide and soon the next wave to ride will be visible. I am ready to do the work! You and Karl are an inspiration! I hope to be there to celebrate with a house warming! hey guys. I live in winder and I do industrial hvac for a living. I have relatives in Dahlonnega , and if you want some help running duct let me know. If I know what you need , I can possibly round some materialss too. I once sold enough hand-made “nutcracker” shortbread cookies, pressed one at a time into a mold, to build a dance floor for my students. My arm never forgave me, but the children were so happy. If you wanted to bake dozens of christmas cookies and then ask for donations for them, I would buy some. You have learned how to do many things that I have never done, like build a web page and make jam, and things many people find difficult, like exchanging understanding for being understood–even in close quarters. You have a lot of skills that are sale-able. I have never built anything larger than a birdhouse, and you have. Perhaps one of those things that makes you unmistakeably you is what will help rebuild your savings this time. Personally, I have a master’s in accounting, and I can’t buy an entry-level job in this town. I think your plan was way better. I just found your blog. We are totally in a similar boat. We live in a tiny house (400 sq ft) – though when I see pics of your tiny house, mine seems downright spacious! We have a toddler and another baby on the way. We are working at turning an existing pole barn on our property into “the big house.” We also are doing it on a cash basis. I TOTALLY get the work/save up the money, spend the money/work on the house cycle. It is teaching me patience like nothing else! Look forward to seeing your house evolve!